The Royal Swedish Ballet have a winner of a show with Pär Isberg’s Dream of Swan Lake. It is not radically new in the manner of Matthew Bourne’s version with its corps of male swans, as the dance form is balletic, although most is newly written. However, it is very modern in presenting characters that are flesh and blood. At times, the dancers interpret Swan Queen, Prince and magician but it is the conflict, the love and the loss of real people that holds our attention. Isberg has written some of the company’s most successful ballets including his much-loved Swedish Nutcracker. Thus, he is thoroughly experienced in structuring full length ballets and sets his Swan Lake in the world of theatre, centred on the intrigues and power struggles in a ballet company. The love interest, traditionally between Odette and Siegfried, now plays out between the young ballerina and the choreographer (disarmingly called Fred) who is preparing a new production. Their nemesis is the Principal Dancer furious at his demotion to the character role of Rothbart and itching for revenge. The drama in the white acts is intensified as Rothbart now a full-on dance role, physically tries to force the dancers apart and in Act Three he moves to centre stage. This devil gets the best tunes, the best steps and almost gets the girl. Like a sexual predator he sets about grooming the ingénue Swan Queen and escorts her to the after show party where, like Odile, she can seem to be truly in love before switching to a mocking beauty. The final act brings choreographer and his love together as the studio door opens and they leave hoping for a happier future. These three, well-constructed roles offer splendid opportunities for multifaceted interpretations and the ballet has all the ingredients for a successful opera house production: good use of all the company, plenty of fine orchestral music, a well thought through narrative and enough of the original Swan Lake to please the traditionalists. A prologue sees the choreographer in the studio, playing the haunting theme on a music box while he gazes at the set design. He notices a young company member practicing alone and sees her as his ideal Odette. Into Act One and the full company are in the studio where Fred is casting his new production. In an atmosphere of high energy and challenges, the company are put through their paces taking every opportunity to show off. As Fred, Oscar Salomonsson has the appeal of an ill-groomed puppy but there was nothing mucky in his crisp technique. He is totally convincing as the choreographer, passionate about his production but too sensitive and vulnerable for a position of authority. One of the highlights of the production is an entirely new Black Swan pas de deux set to Tchaikovsky’s alternative music, (better known to modern audiences as Balanchine’s Tchaikovsky Pas de Deux). Isberg sets the steps in fluid contemporary ballet style and then adds a touch of swan. The Principal Dancers go through their paces, Daria Ivanova looking a little put out at having to audition and overshadowed by Dawid Kupinski, showing a cut-glass edge to his technique while his character already hints at a manipulative, dominating man. Elisa Fossati, Jonatan Davidsson and Emily Slawski get to dance the Pas de Trois, with Fred joining in at moments. Strong technique, warmth and musicality were the keynotes with Davidsson showing principal potential. After a visit from the management, a snooty lot sporting haute couture, Fred is left searching for a path between the demands of dancers and the high-handed directors. The dancers mooch off to their dressing rooms with quartets of men engaging in parodies of Little Swans. Principal dancer is enraged when presented with his Rothbart cloak, the female dancers dance around their tutus as the studio dissolves into the lake side. For the lake, set designer, Lars-Åke Thessman, and light designer, Ellen Ruge, using mirrored surfaces and projections have created an enchanting world: liminal and insubstantial. The swan corps bourrée forward out of the mists and Fred’s joy is palpable as he finds the Swan Queen he dreamed of. Jérôme Kaplan’s clever designs dispense with feathers, opting instead for origami pleated tutu skirts that accentuate the line and legs and look absolutely right in this surreal watery world. This act remains substantially true to Lev Ivanov’s choreography, the swans beautifully synchronised in iconic patterns and form. Luiza Lopes was a finely poised Odette, though rather too cool and aloof and not helped by turgid tempi and it was Salomonsson who injected the emotion. 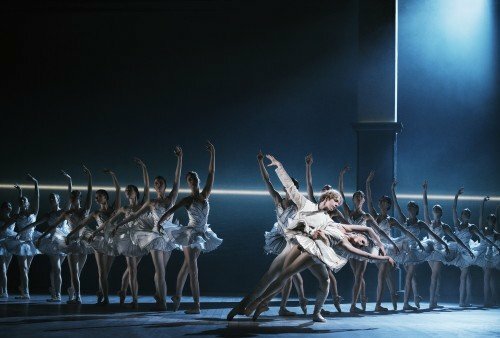 The cygnets, timed to a nanosecond, were splendid as were the two lead swans; Ivanova finding her métier and Sarah-Jane Brodbeck filling the stage with broad elegant gestures. In the second half, designers and Isberg go to town in a brilliantly devised party scene backgrounded by Stockholm’s glittering skyline and foregrounded by haute couture. The young dancer now takes on something of Odile’s character arriving in a black feathered cloak escorted by Rothbart and seduced by diamond bracelets – shades of Manon here! Despite the ingenuity of the structure, as Fred/ Siegfried and Rothbart alternate as partners for Odile, the traditional Black Swan Pas de Deux did not ignite with Lopes giving a sadly utilitarian performance. Rothbart takes centre stage and to the little-used music for the Russian dance Kupinski savours his revenge in a dazzling solo fuelled with testosterone and spiced with sensuality. There is also plenty of scope for the company. The theatre director is feted by a fawning posse of men and ends poised atop the group like the cherry on the cake, there is a sultry trio of leggy ladies and a sparky duet from Kaho Yanagisawa and Frei Ruhl with a novel ending. Tensions rise as Rothbart builds his power base. He shows his contempt as, supporting Lopes after her final pirouette, he then literally tosses her into Fred’s arms. The final blow comes as the company, egged on by Rothbart, mock the choreographer leaving him in total despair. In the final act in a setting, part studio and part lake, the conflict continues. A bedraggled Swan Queen, still dressed in her black tutu, arrives distraught and is enfolded by the flock of swans. The final battle is fierce and physical and only ends when Siegfried and Odette escape. Alone in the studio they find love in a duet of genuine emotion, two wounded creatures clinging together as they depart for a new life. Rothbart, meantime, finds a new young dancer to groom. Pär Isberg’s Dream of Swan Lake is a remarkably clever revisioning of the old story that finds an innovative way to bring new life and reality to a much-loved ballet.